A Microsoft document offers details on how much it could cost companies to maintain Windows 7 PCs if they don't migrate to Windows 10 by early next year. Microsoft will charge as much as $200 per Windows 7 PC to deliver a year's worth of OS security updates after it's officially retired in January, according to a company document. "Windows 7 Extended Security Updates" (ESU), which will add security support through January 2023, was announced in September 2018. At the time, Microsoft said the add-on support would be sold on a per-device basis and in one-year increments for up to three years. Although the company admitted that prices "will increase each year," Microsoft did not reveal Windows 7 ESU's costs. Later, Computerworld located a document aimed at partners and the firm's own salesforce that said prices would double each year. "We believe that the vast majority of customers who need to purchase Windows 7 ESU will need only one year of coverage," the document said in explaining the jumps. "The annual price increases help cover our additional engineering costs of providing the support and are intended to incent customers to continue their momentum on Windows 10 deployments." But while the Word document contained a price list, it was blanked. Only when the document was previewed in macOS or saved in a different format, such as a web page or a PDF, did the list become visible. 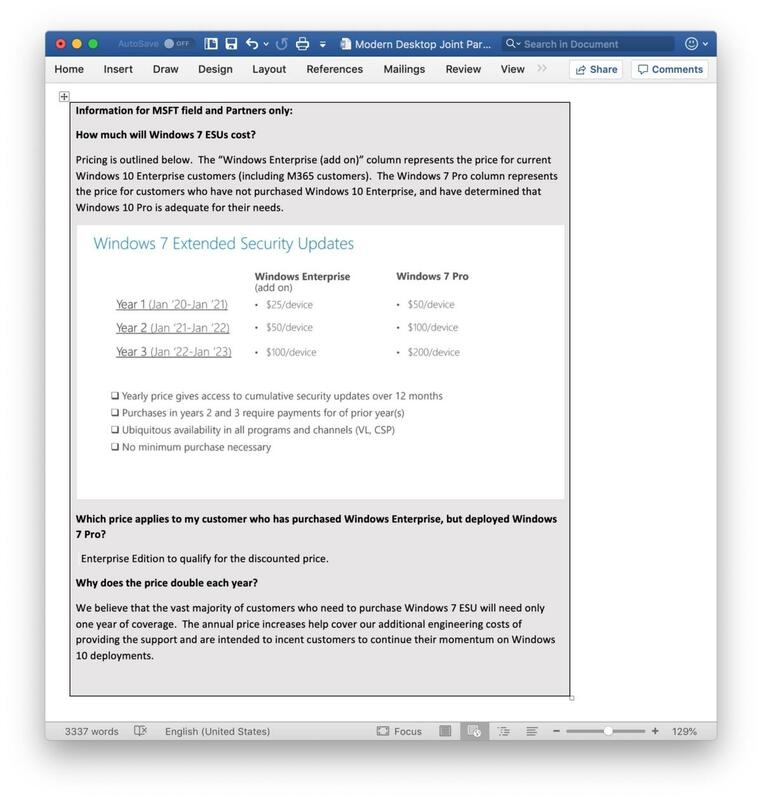 This Microsoft document laid out the cost of Windows 7 Extended Security Updates (ESU), the three-year support extension for enterprises which aren't able to eliminate the old OS before its January 2020 retirement. The least expensive price line - $25-$50-$100 per PC for the first, second and third years, respectively - was for current subscribers of Windows 10 Enterprise or Microsoft 365 Enterprise (the latter is a bigger bundle that includes Office 365 as well as Windows 10). More expensive - double the price - is the $50-$100-$200-per-PC line for customers who plan on migrating to Windows 10 Pro rather than Enterprise. To cover a single Windows 7 PC for the three years will run a company $175 if it's now a Windows 10 Enterprise customer, or $350 per Windows 7 system if it's not, and plans on never becoming one. Microsoft has used other incentives to push firms to adopt the more expensive, more capable Windows 10 Enterprise over Pro; the ESU pricing is simply another example. Microsoft also spelled out other ESU provisions, including requiring companies to pay for preceding year(s) if they jump into coverage on the second or third year (perhaps because they gambled on exterminating Windows 7 partway through 2020, but then failed to follow through). Also, ESU has no minimum purchase requirement, say, a bottom-end number of devices to cover. Windows 7 machines will continue to receive support for Office 365 ProPlus while they're covered by ESU (unsupported Windows 7 PCs will not get ProPlus support after Jan. 14, 2020), as will Internet Explorer 11 (IE11). Microsoft said that ESU will be available from multiple volume licensing channels later this year from official partners or Microsoft's own sales teams.